A profile of Charles Manson who, along with some members of his bizarre cult, the ‘Family’, was found guilty of seven murders at the beginning of the 1970s. 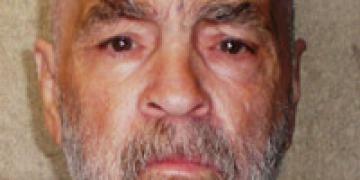 Although Charles Manson is notoriously connected to the brutal slayings of actress Sharon Tate and other Hollywood residents, he was never actually found guilty of committing the murders himself. However, he is still associated with several brutal slayings including the famous ‘Tate-La Bianca’ killings that have immortalised him as a living embodiment of evil. Images of his staring ‘mad eyes’ are still used today to illustrate countless serial-murder news stories. Together with Manson, The Family (his young, loyal drop-out disciples of murder) are thought to have carried out some 35 killings. Most were never tried, either for lack of evidence or because the perpetrators were already sentenced to life for the Tate/La Bianca killings. Today Manson is sill carrying out a life sentence. He was born Charles Milles Maddox to Kathleen Maddox, a 16-year-old girl, who was both an alcoholic and prostitute. Kathleen later married William Manson, but the marriage ended quickly and Charles was placed in a boys school. Despite running back to his mother, she didn’t want anything to do with him. Soon Charles was living on the streets and getting by through petty crime. By 1952, Manson was soon spending more time in prison. In total he spent more than half his life (17 years) incarcerated. He was noted for being a ‘model prisoner’. A new chapter in his life began in 1955 when he married a 17-year-old girl and moved with her to California. She became pregnant, but Manson resumed a life of crime again, this time stealing cars. It wasn’t long before he was back behind bars and by 1956 his estranged wife had left with their child and her new lover. Manson later had another child with a different girl while out on probation. He was described by probation reports as suffering from a ‘marked degree of rejection, instability and psychic trauma’ and ‘constantly striving for status and securing some kind of love’. Other descriptions included ‘dangerous’, ‘unpredictable’ and ‘safe only under supervision’. From 1958, Manson was in and out of jail for a variety of offences including ‘pimping’ and passing stolen cheques. He was sent to McNeil Island prison in Washington State for ten years. During this time he had also raped a fellow male prisoner while brandishing a razor. Paradoxically, it was whilst he was incarcerated that he tapped into his creative talents and learnt how to read music and play the guitar. He was finally released on 21 March 1967. The following year he was to spearhead a murderous campaign that would make him one of the most infamous figures in criminal history. In many ways Manson reflects personality traits and obsessions that are associated with gurus of cult-quasi-religious groups that began to emerge in the 60s and are still with us today. He was pathologically deluded into believing that he was the harbinger of doom regarding the planet’s future, in much the same way that cult and evangelist figures today claim prophetic knowledge of the world’s end. Manson was also influenced, not only by drugs such as LSD, but by art works and music of the time such as The Beatles song ‘Helter Skelter’ from their 'White Album'. He had a strong belief and interest in the notion of Armageddon from the Book of Revelations. Scientology and more obscure cult churches such as Church of the Final Judgement were also fleeting interests. After 1967 Manson gathered a group of followers who shared his passion for an unconventional lifestyle and habitual use of hallucinogenic drugs, such as LSD and magic mushrooms. ‘The Family,’ as they became known, moved to San Francisco and later to a deserted ranch in the San Fernando Valley. His followers, numbering around a hundred, also included a small hard-core unit of impressionable young girls. They began to believe, without question, Manson’s claims that he was Jesus and in his prophecies of a race war.